Last week, for the first time I joined ''Beechat'' on twitter and the topic, was beauty and skincare. Somehow, we talked about skincare routine's and when everyone was talking about their blog post that I understood that I don't have one. So, here I am today with a blog post about my skincare routine.Please remember that I, as always, will be joking more than actually talking seriously. I have very sensitive skin and I have had a lot of problems in earlier years. There was one time when I actually couldn't use anything chemical and it took me ages till I found a perfect makeup remover. Till that, I was using Nivea all natural cream as a remover and let's me honest it's not the same. So not long ago I found Himalaya eye makeup remover with cucumbers. It removes the makeup very gentle, you just have to very careful with it because when you use it too much it makes your eyes irritating. After taking off my makeup twice a week I use a facial cleaner from Avon Planet SPA line with white tea. This cleaner is perfect because after using this one it doesn't make your skin dry or you don't get the feeling of tightness, which for me also was a huge problem some years ago. The products I used made my skin feel dry and that's why for a years or so I stopped using some products like that at all. The best thing my mum and I discovered two years ago and been using these till now are all natural tonics made in Latvia. The one you can see in the picture is chamomile. It smells exactly like the flowers and is really great for skin. This is definitely my all time favourite facial skin product and I will not change it .Before I had one with peppermints. One in a while I treat my face with some nice masks. The one have is Avon Cucumber peel-off face mask. Peel-off face masks are definitely yes. I used it at least once a month, not more. Also, I often like to try those one time kind of masks. It's a nice way how to try something new not buying the whole stuff. If you read my post about avocado oil and how good it is for everything, then you know that it will also be good for facial skin. Apply a little bit of oil in the places where your skin is dry or red and let it sink in. Your skin will feel better immediately. I have absolutely stopped using products for acne, because now when I'm twenty it is not such a huge problem for me. I do have a ''pencil'' which I apply exactly on the blackhead if I do get ones from eating too much sweets or before the time of the month. Thanks God those days when my whole face was covered in them are over. Basically, that's it. As always - quality before quantity. 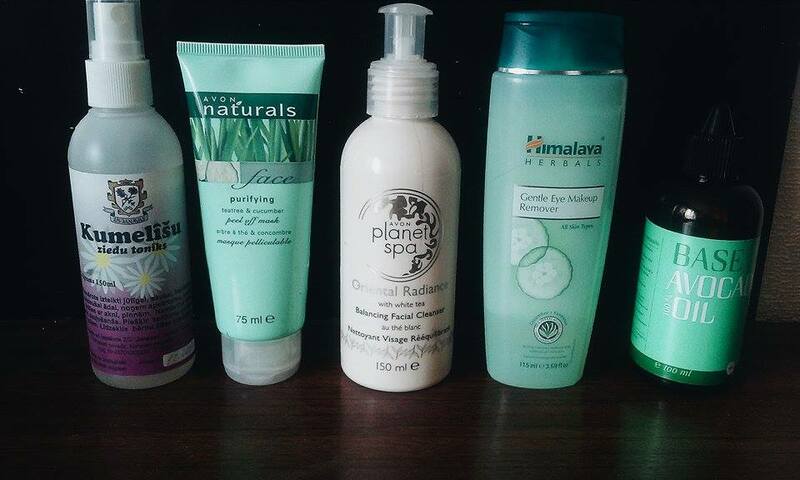 What are your favourite facial skin products?